“What time are you aiming for?” is the first question people ask when I tell them I’m running it. Whilst training I think about my motivation and what I’d like to achieve. I know it might seem like a very strange concept of fun, but I love long distance stuff that makes me dig deep, harness my motivation and find a way to keep going when it hurts. Running the London Marathon is a once in a lifetime opportunity and I want to make the most of it in every way, soak up the atmosphere and be inspired by the people around me. I have no expectations with what time I’m aiming for, but I definitely want to empty the tank and finish the race knowing I’ve given it everything. A wise man once said to me “don’t forget to smell the roses” as I was about to start my first triathlon. As I raced around the course, I began to understand what he meant. Don’t get so bogged down in times, splits and expectations that you forget to look up and appreciate your surroundings, the atmosphere and how badass you are for doing it in the first place. That’s the most impressive part; that you got up and did it. What time you do it in, is only important insofar as how much it means to you. The first part of my training involved restoration and transformation. After cycling across the USA and running mountains in Patagonia at the end of last year, I was a little tired coming into 2016. I enlisted the help of the expert team of physios at Beyond Health, who have been amazing. Led by Joe Lawrence, the team is considered to be one of the best musculoskeletal health groups in London. The first thing they did with me was a full body analysis watching how I move and identifying areas of weakness. I didn’t go to them with an injury but with the desire to become stronger and more resilient to avoid future injuries and run faster. I booked into weekly sessions starting with one-on-one rehab classes focusing on re-learning how to make small movements in the right way so I can transfer this to my running. Next up were analysis sessions on the treadmill to chart my progress, work on my technique, speed up my cadence. In between I’ve had deep tissue release work combining acupuncture with sports massage to ensure my muscles stay loose and avoid niggles turning into problem areas. Less than four week to go until the big day and it’s time to focus on performance. Beyond Health helped me choose the perfect shoe for my style and goal. I ran 100kms in Race to the Stones last year in the Inov-8 race ultra shoes and loved them, so I have decided to stick with Inov-8 and use their road claw shoes for the marathon. I’ve actually had a fair few issues with my feet whilst trying out different shoes which hasn’t been fun! Blood blisters, and all sorts, so now I’ve chosen something that works, I’m sticking with it. The road claws from Inov-8 that passed the test. Love the messaging! I’ve also got a Garmin Forerunner 920XT to track all my training, my first running watch! I’m a newbie to strava and running technology but am now recording everything, hit me up here if you’re on it. 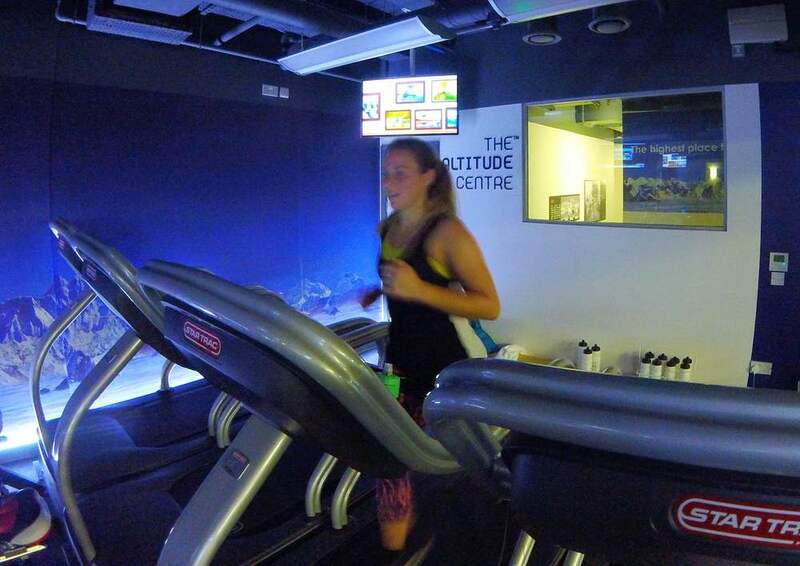 My training has involved a mix of long runs (up to 20 miles so far), strength training with kettlebells, cycling and high intensity workouts doing sprints at the track or on the treadmill at The Altitude Centre. I can’t recommend the team at Beyond Health enough. I feel like they really care about my health and performance in my fitness goals as well as general well-being in life. They take the time to explain scientific stuff in a way that’s easy to understand and absorb, and they’re exceptionally passionate about their work. If you go and see them, say hi from me! Picking up supplies before the Lucozade photoshoot. Photos coming soon! With thanks to Beyond Health, Lucozade and James Carnegie Photography.